Nutrition labels can be confusing and deceiving. 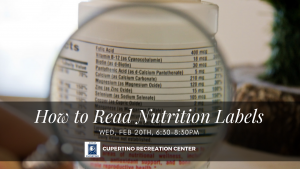 Join us for an informative discussion on how to read and understand nutrition labels and how they relate to you and your health. Workshop will include food samples, so you can taste and try what we discuss. Material fee: $5 due to instructor.